Happy Thursday loves! It's technically my Friday so I'm super excited! And before I start today's post I wanted to give a huge shout out to my bestie, Kerri. It's her birthday!!! Ok, now onto the post, yesterday was super busy at work so it will be nice to have some extra down time this weekend to catch up and relax. Speaking of, sorry for my absence yesterday. It was hectic and my phone kept getting used for commercial and photography shots so responding to emails wasn't really an option. So, earlier this week we got another little sneak peek of fall weather so I took full advantage and busted out the destroyed skinny jeans and booties. You might remember these booties from a Friday Favorites post I did a few weeks ago and thanks to some encouragement from you guys I finally broke down and got them! Man am I glad I did too! They are so comfy and cute and I love the color! Ok, enough about the booties. Lately I've been loving the more slightly destroyed denim look which is odd for me since until recently I didn't even like destroyed denim at all. But I've really been digging the "busted knee" destroyed look especially but with me being so short I was having a hard time finding a pair that I really loved that weren't $200+. Don't get me wrong, I am all about spending some money on a good pair of jeans but I just had a hard time justifying spending that much on a pair that were already ripped. I'm sure that sounds silly, especially coming from a "fashion" blogger but it's true! And ignore my awful hair in this post, it was super windy and my hair was not cooperating! Your look is so quintessentially fall, love, love, love it. 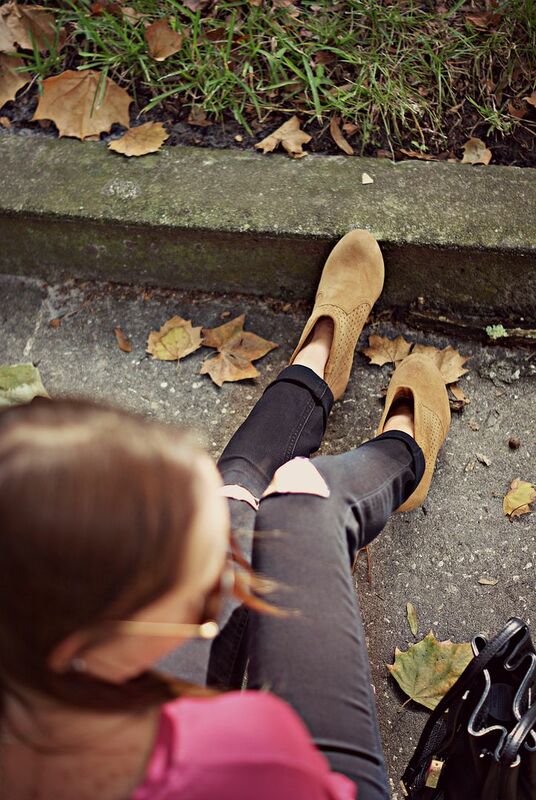 So pretty to have the fallen leaves and the denim with the booties look so fabulous together :)! Happy FRIDAY to you and happy bday to Kerri! Looks like the perfect comfy look for Fall! :) Love the color of that top! Happy "Friday"!! So cute! Loving this laid back look! The jeans look amazing and they are fab with the oversized top! Love these shots, such a cool location you found! The affordable pair of dark skinnies I ordered didn't fit so I definitely need to check out your pair. 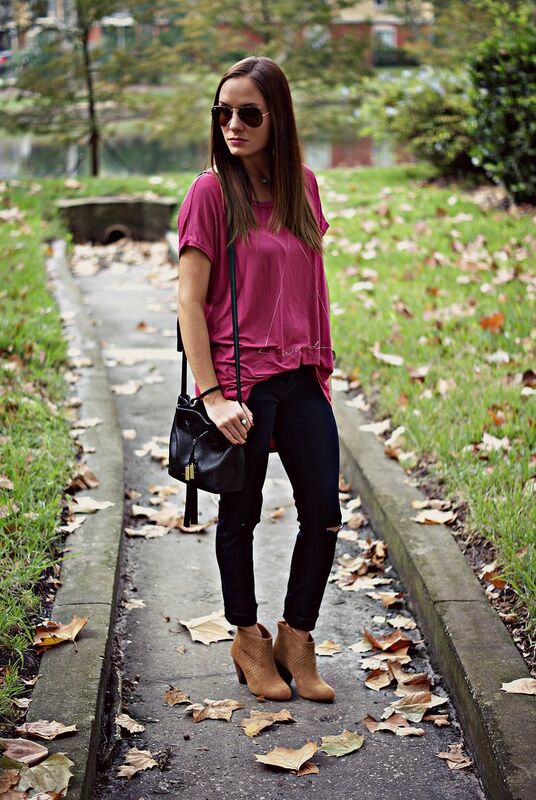 Love the booties and this casual look on you! I felt the same way about distressed denim until recently but now I love the look! I haven't found a pair I like either but I'm going to check out these that you are rocking!! Love that bright pink top, too! love this! and i am really impressed how you were able to find some fall in FL! 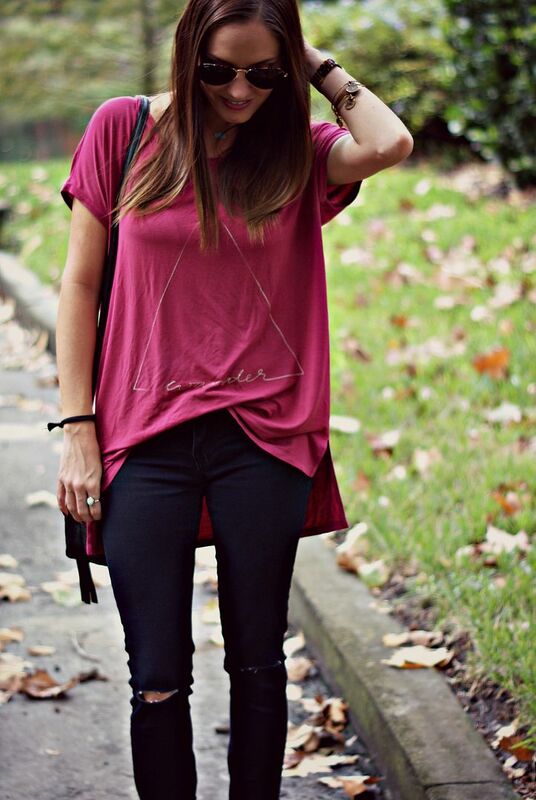 This shirt has the perfect amount of drape and still looks so stylish! Those booties are SO cute! I love the top and the jeans, the whole look! It is definitely a little crazy to spend tons on ripped jeans, so I think I am with you on finding the perfect affordable pair!! 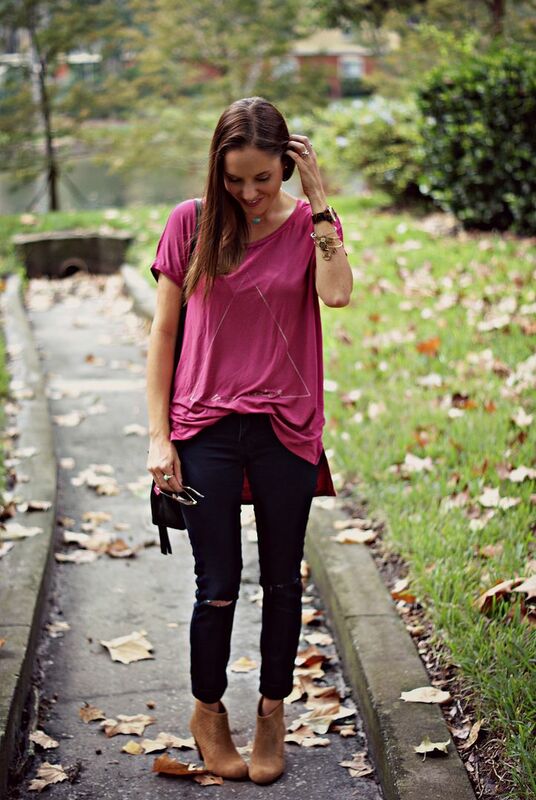 Love this slouchy tee- and the berry color is so pretty with your complexion + hair, doll! yay for birthday love and cute outfits all in one post! those booties are fab and your jeans turned out great! cheers to a long weekend! love you!!! Those booties are so cute! I love the way you styled them with the jeans. Normally I don't like ripped jeans either (I totally understand why my dad would complain about me buying things that were ripped when I was younger), but these really work with the outfit! Happy Friday to you, I'm definitely jealous! Obsessing over those sweet booties! So fun for right now! This outfit is so cute! I love this look- so glad you finally found the perfect destroyed denim. Seriously loving your bag too! This is such a great casual fall look! Love it. Love this look. The drapey shirt works perfect with those jeans. Hope you have a relaxing day! You always find the most gorgeous spots to take your pictures! This look screams fall and I love it! Wow, are those pics from Florida?! Looks like fall finally! I love loose tops like that one with skinnys!! LOL I remember the first time I wore distressed jeans around my grandma and she said: "You BOUGHT them like that?!" I love how different the design of this top is! I like that it's oversized, but not too baggy. Perfect with skinnies! Super cute! I love your booties! Such a cute look! And I love those booties!!! Andrea was wearing a darker pair in her outfit post today and I am just seeing them everywhere. So cute! Great look! I am loving your jeans! Yay for having a short week. This look is super cute on you. I got my first pair of distressed jeans a couple months ago and I can't stop wearing them! Also I am in love with your bag! Dying over that top, I love any top that is loose fitting with tighter pants! This look is perfect! I love the ripped denim and that color looks so comfortable and cute on you! Loveeee this look on you! Those booties are perfect. Have the best weekend! Such a cute, casual outfit for fall! That dark burgundy color looks SO darn good on you. Totally love the color of that top!! You look gorgeous!! I need more fun, cute t-shirts when I am in the mood to just throw something on and go yet still look put together! ohhh love this look girl! the booties are fabulous. i feel you on the ripped jeans, because i am somewhat tall, i have the darndest time finding ones that don't sit right ON the knee - because when they do, it rips even more, you know? it's so hard to find jeans that have a ripped hole under the knee lol. ps. not sure if you are updating your blog or whatnot (i am haha) but your about me picture is gone? photobucket link? just wanted to let you know. hope you're having a good weekend! Love that tee! Such a cute look.